Using your mobile device to locate and view Wisconsin real estate for sale is now even better with First Weber’s updated mobile apps. Visit the iPhone app store or Android app store to get your updated copy. This feature automatically detects your location when the app is opened and all properties in the surrounding area are shown. You can then filter and search. 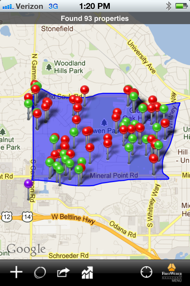 What a great way to check out homes for sale while you drive through neighborhoods. You can even select points of interest to map around the properties such as school locations, grocery stores, retail locations and more. You can draw an area and save it for future use, be able to view active and sold properties within area and view market data. View details, see photos, call, text or email agent right from the app. How different home searching has become! Let us know what you think of our apps in the comments. For a detailed look at the First Weber mobile apps with many screen shots, please see First Weber agent Charlie Wills’ post about the First Weber app on his personal blog, Madison real estate news with Charlie Wills. Definitely worth a visit to find out more. Great job, Charlie! Wisconsin photo Friday – Congrats on Getting to the Rose Bowl, Badgers.